White shirt, with shadow pin-stripes. Navy blue v-neck, with thin white stripe in middle and two thin red stripes either side of it. Navy blue cuffs, with thin white stripe in middle and two thin red stripes either side of it. Thin navy blue stripe along shoulder. Embroidered emblem on left breast. Two embroidered navy blue concentric diamonds on right breast, with 'umbro' in navy blue lower-case lettering underneath. Red numbers on reverse, with a white border, outlined in red. Navy blue shorts, with white drawstring. White seams, with two thin navy blue stripes, each edged with a thin outer red stripe. Two embroidered white concentric diamonds on left thigh, with 'umbro' in white lower-case lettering underneath. Embroidered emblem on right thigh. An Airtex short-sleeved version of the shirt, with red numbers on the reverse in the old Umbro font last worn by England in 1974, was worn for the games in Mexico and Los Angeles in 1985. A third short-sleeved version of the shirt was worn at the 1986 World Cup in Mexico and in the two warm-up games for the tournament, in Los Angeles and Canada. This one featured wider shadow stripes and a plain white hem replacing the cuffs. The red numbers on the reverse were as in the previous year's tour. For the World Cup tournament itself, 'FIFA WORLD CUP MEXICO'86' was displayed in navy blue directly underneath the emblem. When Gary Lineker scored four goals against Spain in Madrid in 1987, two white concentric diamonds were worn at the base of each digit of the red number 10 he wore on his back. White numbers in the same font as on the reverse of the shirts were worn on the left thigh of the shorts, above the Umbro logo, for the 1986 World Cup tournament games. 47 England internationals appeared in this shirt. Kenny Sansom had also worn the previous white shirt (1980) the most. Nineteen players won their first cap in the shirt, including Gary Lineker, who went on to win 80 caps, Tony Adams, who won 66, and Chris Waddle, who won 62. Nineteen players made their last international appearance in this shirt, including Ray Wilkins� 84th cap, Trevor Francis� 52nd and Paul Mariner�s 35th. Of the five players that won all of their caps in this shirt, only two (Steve Hunt and Alan Kennedy) appeared more than once, but their international careers were over after their second game. Hunt had been substitute in both of his appearances. 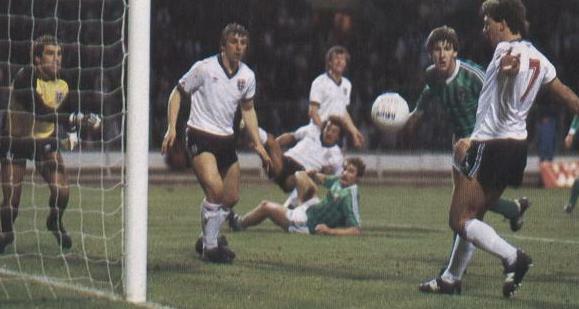 Seven players scored their first international goal in the shirt, with Gary Lineker going on to hit 48 for England. Tony Woodcock was one of eight players to score his last goal for England in this shirt, when he netted for the sixteenth time at international level. Only three players scored all of their international goals in this shirt, and of them, only Viv Anderson scored twice. All of Bryan Robson�s appearances in this shirt were as captain. Terry Butcher led the team out for the first of seven games as captain. England returned to Umbro at the beginning of 1984, signing a five-year contract worth �1m. The red and royal blue flamboyance of the previous Admiral kits was gone and in its place was a predominantly white shirt, with only very minor red and navy blue edgings. One other noticeable feature was that of the Three Lions emblem appearing on the shorts for the first time, a welcome addition. This kit saw off the British Championship after a century of competition, but it was also worn for England's first ever away win in Brazil, a most unexpected result coming off the back of a very disappointing season for Bobby Robson's side, who had failed to qualify for the 1984 European Championship in France. The Brazil game also gave us a glimpse of the shorts and socks from the new red uniform, revealed in its entirety in the next game, in Uruguay. England qualified unbeaten for the next World Cup in Mexico and travelled out a year early to experience the climate in advance. Just as in 1969 and '70, an Airtex version of the shirt was used and the design was further modified for the tournament itself, in 1986, when the cuffs were removed for extra ventilation, though the shirt was not in the Aertex material. After the traumas of the 'Hand of God', England returned home to set about qualifying for the 1988 European Championship finals in fine style and in May 1987, Umbro upgraded the white uniform, a sure sign that all was well in their blossoming relationship with the national team. Notes England wore the white home shirt with the 1984 white away change shorts, and the 1984 red change socks against Brazil. Notes England wore the white home shirt with the 1984 white away change shorts, and the 1984 red change socks against Chile. Notes England wore all white, the white home shirt with the 1984 white away change shorts, and white home socks against USA. Notes England wore all white, the white shirt with the 1984 white change shorts, and white socks against Spain. Notes England wore the 1984 red change shirt with the blue home shorts, and 1984 red change socks against Turkey. This shirt was commercially available from its outset via the mail order department at Wembley Stadium. England pose for the camera prior to the World Cup qualifying match with Romania in Bucharest in 1985.